Have you seen our Warm and Wooly Throw Trio kits?? We have a pretty new full color layout of all the mixed colorway options for this kit. Check it out here!!! You can also order this kit in a single colorway if you prefer. 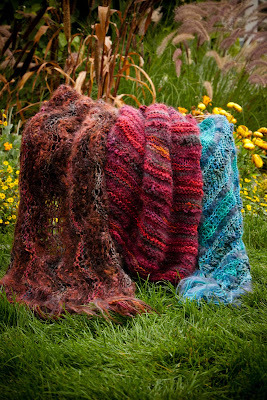 These kits are available through any retail yarn store that carries Mountain Colors Yarn. The kit comes with 3 different patterns....a simple knit version, a crocheted version and a knitted lace version. We know of several people who have made a throw for each of their adult children!! If your yarn store doesn't stock these kits have them call us with your color choice and we will dye one for you! !